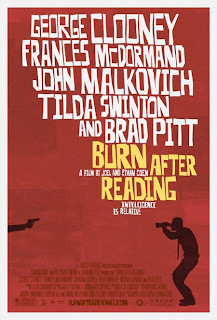 Cam's Cinematic Episodes: Film Review - BURN AFTER READING: Plenty Of Smoke, But Not Much Fire. Film Review - BURN AFTER READING: Plenty Of Smoke, But Not Much Fire. Hello all. If you don’t mind, I’d like to preface my review of Joel and Ethan Coen’s latest film, Burn After Reading, with a joke that will hopefully tickle your funny-bones. So, a guy walks into a bar. It’s in Chicago, and it’s raining hard outside. Now, the guy is wearing a gray overcoat, with a battered fedora and nerdy glasses. He’s an accountant. Anyways, the guy takes off his coat and hangs it on a crooked coat-rack and walks up to the bartender, who’s about 60. The bartender is nervously reaching for the tel ephone, but the guy doesn’t see that. So, the guy looks at him and says: “What do you recommend for a wet accountant?” The barman looks him up and down, and says “whiskey on the rocks”. The guy drinks it and leaves. The above anecdote best explains how I felt walking out of Burn After Reading, an anarchic ensemble comedy that jerks and shoves the audience through a litany of plot twists and turns only to deposit them, breathless and impatient, back into their seats, pat them on the head and inform them that the punch–line is that there isn’t one. Thanks for coming folks, don’t forget your jackets on your way out. 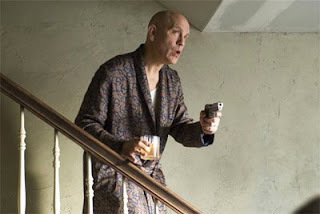 Burn After Reading relies more on a complex scenario than a plotline: a recently unemployed CIA agent named Osborne Cox (John Malkovich) has heatedly retired from the spook game and decided to write his memoirs. This decision exasperates his icy wi fe, Katie (Tilda Swinton), who has been conducting an affair with married serial philanderer/treasury agent Harry Pfarrer (George Clooney) and is determined that each of them divorce their current partners in the interest of a more socially acceptable union. Meanwhile, Osborne's book project has turned into an vengeful expose of his former employers. 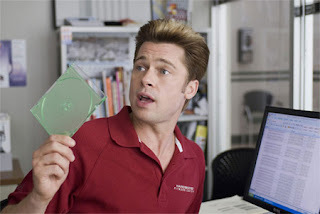 In preperation, he has created a CD-ROM of top-secret figures and statistics which, through fateful circumstances, ends up in the hands of dense personal trainer Chad Feldheimer (Brad Pitt) and vain, insecure Linda Litzke (Frances McDormand), employees of a local gym called Hardbodies. Through an unimaginable series of absurd coincide nces involving the aforementioned CD, as well as torrid affairs, each of these characters find themselves, often obliviously, caught up in a seemingly high-stakes game of espionage that makes so little sense that the Coens provide a pair of G-men, played by J.K. Simmons and David Rasche, to lend voice to the audience’s bewilderment. Now, this isn’t the first time that the Coen brothers have played around with the concept of randomness and meandering narratives. Remember that the duo won Oscars last February for the brilliant No Country For Old Men, a far deeper and challenging film than Burn After Reading. More importantly, however, they were the masterminds behind the 1997 cult-classic The Big Lebowski, which introduced us to the Dude (Jeff Bridges), and plugged him into a film noir plot that was as hazy as his own mindset. Well, Burn After Reading can best be described as a less-ambitious Lebowski with spy-thriller conventions and unlikably needy characters. Still, there are a few delights along the twisty way. Brad Pitt, an actor whom, despite his popularity, often se ems as lively as balsa-wood on screen, is having a ball here and makes Chad a dim-wittedly brilliant creation. 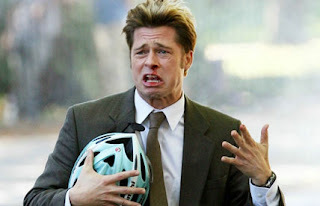 Most of the laughs in the film result from his delirious idiocy, especially in a goofy scene with Malkovich in a car, where Pitt tries to intimidate the furious former agent with ludicrous eye-squinting and tough-guy attitude. Pitt is fully committed throughout, and I found myself having flashbacks to his ace comedy-relief in True Romance. Someone get this guy a meeting with Judd Apatow, stat! Equally amusing is J.K. Simmons, who you’ll recall from Juno and the Spider-Man series, as the befuddled CIA supervisor who, in two gang-buster scenes, mutters and shakes his head in disbelief over the increasingly jumbled plot developments. I was also amused by the musical contributions of Carter Burwell, who over lays the tiresome lunacy with cheekily hard-edged thriller music, which establishes the intended espionage-genre satire. But aside from these simply joys, I found myself blankly staring at an often lifeless patch-work of missed opportunities. It seems as though the Coens, so intent on crafting a droll cinematic F-U to the audience forgot to write anything very funny for their all-star cast to say. Pros like McDormand, Malkovich, Swinton, Richard Jenkins and Clooney are working hard, but haven’t much witty to say or do. And the mid-film int roduction of a particular... apparatus is amusing, but missing the necessary punch to make it classic. It’s kind of dispiriting to watch the massively talented Coen brothers deliver tired sardonic statements when they have so much more to offer. Burn After Reading is an okay ironic in-joke, but as a film it’s the equivalent of having Porky Pig sputter “TH-TH-TH-THAT’S ALL FOLKS!” at the end of the second act. *Originally published in SFU's The Peak: Sept 22nd. Film Review - RIGHTEOUS KILL: Dead On Arrival.